Hi I'm Marianne! 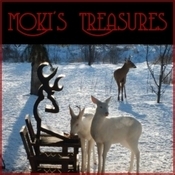 Moki's Treasures is my booth here on Bonanzle. I'm no stranger to internet selling. I've been a seller on Ebay for over 7 years. I take pride in customer service and saving my customer's money on shipping. It's my policy to automatically combine purchases so you save! I'm a proud member of the Bonanzle Action Club and like to find ways to promote the site. If you have any ideas on how to promote Bonanzle, just email me at poconomoki@earthlink.net or contact me from the listing page. Have fun Bonanzling! I'm located in the beautiful Pocono Mountains of Pennsylvania. I offer local pick up for the folks located in NEPA. I have many things still to list, so if you're looking for something in particular, contact me and I'll see if I have it. I offer COMBINED SHIPPING AUTOMATICALLY ON MULTIPLE PURCHASES. My shipper of choice is the US Postal Service. My preferred shipping method is Priority Mail with Delivery Confirmation for all items over 1lb. For lighter items 13 ounces and less I use First Class Mail and Media Mail for books. You may use Paypal, Money Order, Cash and Personal Checks (there is a 10 days hold on shipment of item until the check clears). I ship within 48 hours of confirmed payment excluding weekends and holidays. Insurance is optional, but I cannot be responsible for damage, loss or stolen mail while in transit. I'm always here, so if you have any concerns or questions, please email me! mokistreasures doesn't have any items in their booth! Always have confidence when you deal with this seller. Moki is a super seller and a great person, also a trusted buyer. Thanks for birthday wishes> Anyone dropping POSiTiVE energy my waY = definitely deserves my individual PERS0NAL eND0RSEMENT ~ Please take a moment to visit membersâ€™ (mokistreasures) b00tH nextâ€¦MONTR0Se approves this message! Great friend and trusted buyer and seller! An asset to bonanzle! Moki is a real asset to Bonanzle! A great seller and buyer — terrific communication, great items, fast payment….A+++ all the way! She is a Blessing What a great business person, she is A++++++++++++++++++++ all around.So lucky for me to have time to chat with you! Marianne is a true asset to bonanzle. I will definitely buy from her again. Moki is one of the best sellers and buyers in the Bonanzle Community today! She is a joy to do business with and has become a great friend too. We are all lucky to have her. Thank you for all that you do Moki! Delightful Bonanzler…I have dealt with her as both a buyer & a seller…Great experience either way…Can’t go wrong here! Great seller & supporter of Bonanzle! Super buyer too. Folks, it just doesn’t get any better than mokistreasures!!! Moki is just an all-around lovely person who makes Bonanzle a great place to be. Also, a fantastic seller with wonderful customer service. May God bless Moki always! Just a super delightful person to do business with! So very friendly to talk to whether you have a question or just dropping by to say hello! Very much an asset to Bonanzle.